When discussing technology, acronyms get thrown around more often than they are understood–SCSI cable, LCD, IP, DVI, etc. Today, we’re going to examine HDMI: what it means and how it works. But first–imagine your ideal home theater system. Can you see all the tools and machines in place? Maybe a video wall? A few gaming systems? Custom surround sound, as well. Now, how do you connect all those audio-video devices efficiently? HDMI is your solution! ...read more. Searching for tech solutions to attract customers and reach out in a unique way? Ditch the static signs and dated clipart! 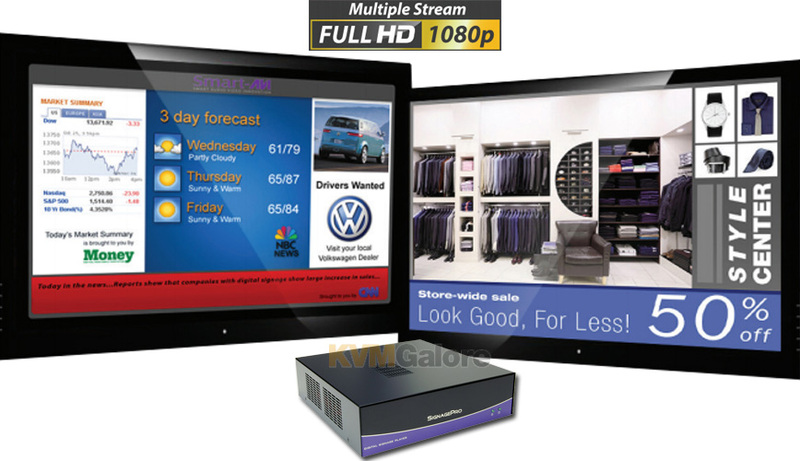 Signage Pro HD is a standalone digital signage tool that uses one central host PC as a complete hardware and software unit. Signage Pro HD is able to control multiple remote display devices, each independently running an array of vivid visual, audio, and graphic programs including Flash files, HTML, QuickTime, Microsoft Office, and JPG. KVMGalore isn’t just your source for tech solutions made easy; we’re also here to reward your purchases- with ClubPoints. ...read more.